These are some races/years that stand out as important to me in the 2,400 plus races I have competed in over the years, not always major competitions, but events that tickle my own motivations. 1979: First of my four wins in the Northumberland Coastal Run gaining me local .notoriety’. The race was declared the most scenic in the UK two years ago and I was event organiser for over 20 years. 1983: First Edinburgh to Glasgow team medal (bronze). 1984: Bronze medal in the North of England 3000m steeplechase. Ran my personal best of 9:02.95 for the 3000m steeplechase guesting in the England v Sain v Sweden International at Gateshead. Scottish Six Stage Road Relay, Edinburgh AC first team, first club major team medal. 1987: Won the North East Counties track 10,000m championship in 30:42.5, running the second 5000m in 15:03. 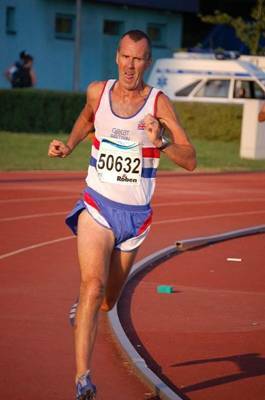 1993: First British Masters medal, runner-up in the M40 3000m at Cosford (8:45.2). Third in the Scottish Masters cross-country championships, runner-up 6 times, 3rd place 4 times. British Masters Cross-Country International, Scotland v England v Wales v N Ireland v Eire, third M45 in Ballymena. Team gold with Morpeth arriers in the North Eastern Championships, first win in 15 years, I was also in the 1982 team. 1998: am Scottish Vets Indoor 3000m first pm Scottish Vets CrossCountry second. 1999: British Masters Road Relay Championships, Sutton Coldfield, first Ron Hill Cambuslang. European Masters Track 10000m, Potsdam, silver medal. 2003: Northern Senior 12 Man Road Relay Championships, first team Morpeth Harriers, (Leg eight), team gold at age 51 after so many attempts in the race. 2005: Ran 16:40.51 in the World Masters in San Sebastian, reckon this was the last decent time I have achieved, although age graded might indicate otherwise. Silver team medal with Morpeth in the North East Counties (Northumberland, Durham, Cleveland) individual/team medals in four decades – 1970s, 80s, 90s, 00s. 2007: Second team gold for Scotland in the Masters Cross-Country International in Belfast. Marathon: 2:29:28 (London, 1982) Decided I am not a marathon runner). Archie still has 2 years to go as an M55, ran in 30 countries, hopingto add another 4 by the end of the summer, not chasing Ron Hill! Do not intend packing in but for the dreaded injuries.